Encountering the God who works through the circumstances of life, and can turn our 'poverty' to 'plenty' through Jesus. I am in 2 very different groups.We decided to try Ruth,as the usual church material came only erratically .Ruth would be short,and a good test to see how we got on. We have found it good on all counts, opened up the scriptures - we had no idea Deuteronomy was such a vital book - and also resulted in helpful discussion of personal problems etc, We think we may continue with another book but haven't told the Clergy, they might disapprove of us stepping out of line! This was a great book for our group (5 older women). Everyone responded so strongly to the story of Ruth and the book was a great help in getting people to talk and relating the story to people's lives today. I am used to leading bible studies, but I felt the book would allow anyone to lead the bible study whether they'd done it before or not. I've gone ahead and ordered 4 more bible studies in this series!! Brilliant guide - easy to use and opened up parts of Ruth to me that I'd never thought about before. We used it at work wiht your Bible study group there and it went down well with everyone and I used it in my quiet ties - worked wonderfully for both! Would recommend this to everyone - how exciting to see God working in the lives of the weak and needy. I run a house group consisting of about 15 young adults - 20-30 years of age. Working class, some middle class and a number of refugees. We ran our first bible study on Ruth and it was giving what I hope it would give. We both delved into the Word and into our own lives. Because of the Leader's Guide it is possible to keep the study on track. I took quite some preparation time, but that pays back. The Bible in Animation videos on Ruth proved to be a good introduction. One word of caution: I think the studies on average take too long to fit into an hour - which is with this intensity the maximum I would require of my group, because we also need time to meet, to eat and to pray. This little study guide has worked really well in our homegroup. It is well written, with plenty of Biblical material, insight, background and thoughtful application to work with. It both deepened our understanding of the text, enabled discussion and gave opportunity to apply personally, to the church and to wider society. The notes at the back proved very helpful but not vital (which I think is a how it should be) and we found that different group members could take it in turn to lead a study without any problem or previous experience. 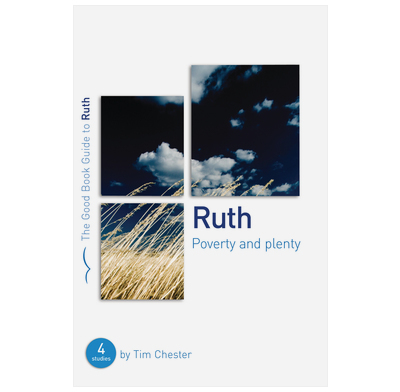 The group thoroughly enjoyed the studies and it gave us all a fresh look at the story of Ruth, whether for those of us who have studied it before or for those who were new to it. Many thanks to Tim and also to the Good Book Company for an excellent resource! I have worked through this book on a one-to-one basis with a new Christian. We have both found it very helpful and easy to use. It appears to be quite basic on the surface, but we soon discovered that it helps you delve deeper into the Scriptures and we both loved the way it put the book into context within the Bible itself, especially the references to Deuteronomy. An excellent read and I would highly recommend it to old and new Christians alike. We used this in our older (mainly 55-75) ladies' Bible Study group. Lots said how much they'd got out of it and what relevance it had to us today - hardship, life not going the way you want it to, being a atranger in a foreign land and God being in control and looking after us in spite of us not always being aware of it, etc. A good number of pointers from Boaz (Ruth's kinsman redeemer) to Jesus.